One man drove 12,238 miles and across 30 states in the U.S. to scrawl a message that could only be viewed using Google Earth. His big shoutout: "Read Ayn Rand." Nick Newcomen did a road trip over 30 days that covered stretches from the Pacific to the Atlantic Ocean. First, he identified on a map the route he would need to drive to spell out the message. He put a GPS device in his car to trace the route he would follow. Then, he hit the road. 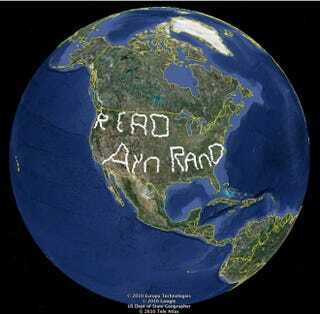 "The main reason I did it is because I am an Ayn Rand fan," he says. "In my opinion if more people would read her books and take her ideas seriously, the country and world would be a better place - freer, more prosperous and we would have a more optimistic view of the future." Newcomen, unlike previous GPS artists, actually traveled the lines he traced on the map. He used a GPS logger (Qstarz BT-Q1000X) to "ink" the message. Starting his trip in Marshall, Texas, he turned on the device when he wanted to write a letter and turned off the device between letters. The recorded GPS data was loaded into Google Earth to produce the image above. "The first word I wrote actually was the word ‘Rand', then I went up North to do the word ‘Read' and finished it with ‘Ayn,'" says Newcomen. And for those who don't know, Ayn Rand is a Russian-American writer whose books Atlas Shrugged and The Fountainhead are among the world's best-selling novels. Newcomen's venture sounds pretty crazy, though he gets points for ambition. What message would you write using a GPS?